A Montblanc midsize ballpoint pen from the Meisterstuck collection. 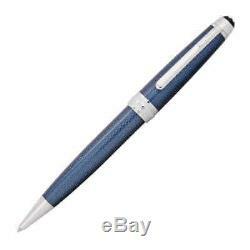 This pen is crafted in a blue lacquered cap and barrel with platinum accents and a twist mechanism. The cap and barrel display an intricately designed engraved hexagon pattern, topped with the iconix Montblanc star emblem. Refills (not included): Mystery Black and Pacific Blue. 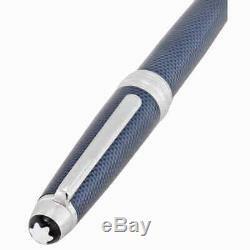 Montblanc Meisterstuck Solitaire Blue Hour Legrand Midsize Ballpoint Pen 112891. We only sell brand new and authentic, first quality merchandise with original parts and packaging. We never sell refurbished goods, factory seconds or replica products. Why such a great discount? We're not an authorized dealer; this gives us the freedom to set our own prices and discount as much as possible. Our watches are fully warrantied and other merchandise is guaranteed against defects. Tracking numbers are sent out moments after an order ships. We cannot change an address after your order has been placed. We apologize, but we can't mark your order as a gift. The item "Montblanc Meisterstuck Solitaire Blue Hour Legrand Midsize Ballpoint Pen 112891" is in sale since Thursday, February 21, 2019. This item is in the category "Collectibles\Pens & Writing Instruments\Pens\Ballpoint Pens\Montblanc". The seller is "leperfect" and is located in Brooklyn, New York. This item can be shipped to United States, Canada, United Kingdom, Denmark, Romania, Slovakia, Bulgaria, Czech republic, Finland, Hungary, Latvia, Lithuania, Malta, Estonia, Australia, Greece, Portugal, Cyprus, Slovenia, Japan, China, Sweden, South Korea, Indonesia, Taiwan, South africa, Thailand, Belgium, France, Hong Kong, Ireland, Netherlands, Poland, Spain, Italy, Germany, Austria, Bahamas, Israel, Mexico, New Zealand, Singapore, Switzerland, Norway, Saudi arabia, Ukraine, United arab emirates, Qatar, Kuwait, Bahrain, Croatia, Malaysia, Brazil, Chile, Colombia, Costa rica, Panama, Trinidad and tobago, Guatemala, Honduras, Jamaica, Viet nam, Uruguay, Bolivia, Ecuador, Egypt, Guadeloupe, Jordan, Cambodia, Sri lanka, Luxembourg, Macao, Maldives, Nicaragua, Oman, Peru, Paraguay.